This 4 bedroom 3.5 bath home includes a dramatic open great room concept with soaring 16 foot ceilings in the main living area with 3 ceiling fans/lights, travertine flooring throughout, and features a floor to ceiling fireplace with a 65" smart TV equipped with high speed internet/wifi, cable TV, Netflix, PLUS, Alexa to provide all of your favorite music. In addition to expansive comfortable seating in the great room there is adjacent seating at an elegant dining room table plus, your own wet bar. The expansive great room opens up to a gourmet kitchen that includes an oversized island, upgraded stainless Wolf Appliances, all with slab granite counters and backsplash. The chef's kitchen and breakfast nook has plenty of cabinet space and is fully stocked for entertaining family and friends. This property features 3 large bedrooms with king sized beds and their own ensuite private baths (one of the 3 bedrooms is a separate private casita). The 4th bedroom or den is a great place for kids to stay and it features a trundle bed (sleeps 2), and a 55" TV with PlayStation 4-complete with games, and blue ray disc player with a large collection of DVD's. The great room opens to a large covered loggia with plenty of seating and a 75" TV wall mounted with swivel bracket that allows for viewing from the pool/spa. The covered loggia features "misters", 2 ceiling fans, and "sun shades" that make it perfect for outdoor living. 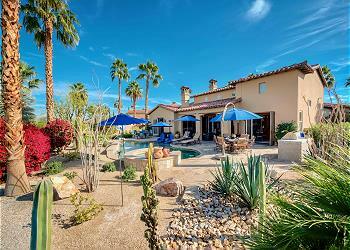 The backyard features a large saltwater pool with tanning shelf and waterfalls, spa with a cascading water feature, both with great view of the Greg Norman golf course and stunning desert landscaping. A unique feature of this pool is the "chiller" that keeps the pool at a cool refreshing temperature year round! In addition to the pool/spa, there is a large built in BBQ grill, 2 tables (seating for 6 at each) plus comfortable lounge chairs for those perfect desert days and nights. With over 3400 square feet of living space, great views, and amazing outdoor space, this home is perfect for either an extended vacation or just a quick weekend getaway.